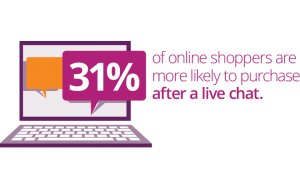 A live chat on your website can increase your sales by decreasing the chance of customers abandoning their shopping baskets. Through offering a convenient service that provides customers with instant assistance, any concerns with the purchase can be addressed instantly. This removes obstacles as questions are answered, problems solved and in turn, sales increased. The live chat agent can help develop a stronger customer relationships and distinguish your business from your competitors. Alongside addressing concerns, this cost efficient service also involves advising customers and highlighting products that they may be interested in based on their personal style. Our outsourced live chat management support targets the needs of your customers and delivers a personalised and friendly service that will go the extra mile for your business.